Gang's Wavelength | The distance between two crests of a thought wave..! If you know any such interactive tutorials, please feel free to share here. All I did was go to “Settings -> Apps ->All -> Xperia Home” and choose “Clear data” (yes, even though you are stuck in an infinite loop because of that error. you can still go to Settings page), and the error was gone. But yes, I had to personalize all my homes screens again as they were reset to the factory settings. You can check your EPF account transactions like a Passbook in the below link. There is no need to create and remember any user id/password. You have to use your mobile number and any of your identification proof number such as PAN, AADHAR, NPR (National Population Register), Bank Account, Voter ID, Passport, Ration Card or Driving License to register and thereafter to login. If you don’t see your Passbook first time, request for the same and it will take 3 working days to get populated. 1. This is all I know as of today, even I haven’t seen my PF transactions till now, but yes, I have raised a request to generate the same. Will update here once I have anything more to share. 2. Hope you know that while entering the PF account number, we need to leave the Extension field blank. It was 13th April 2012 and we had come to Bijapur to attend one of our friends’ marriage party. After the marriage ceremony, and lunch, and bla bla bla, around 3:30pm, some of us (Me & Vivek) wanted to take some rest while others were busy teasing the newly wedded bride groom, so thought of heading back to the lodge. And so we did. But as we were coming out of the marriage hall, we got two bags from Santosh and Sameer, which we were supposed to take to lodge. We hired an auto, reached our lodge, paid him the charges, went to our rooms, hit the bed. Man, where did I keep it? I thought Vivek took both the bags.. But.. When I come down, I see that all are nervous, Sameer more than anyone else because he had kept some valuable gadgets in his bag. After all the inquiries, I started to re-collect that we both came to our rooms with empty hands, meaning we left the bags in the auto! My God! Such a terrible mistake.. But still we were not ready to accept the truth. We tried two things to locate the auto, reported in police station, and checked with other autowalas to see whether they have some kind of association or something where they gather the things they find in their autos, both failed miserably. To find that auto’s details, We even tried to catch hold of the Video Surveillance systems for Traffic Monitoring using some inside link but there also we were asked to wait till next morning! It’s around 9 in the night, and we all had almost made our mind that the bags are gone and there is no way we can get them back. And then, Sameer gets a call from his relative staying in Bijapur, say Mr.X who started inquiring about those two bags. Sameer was super excited and called me immediately. Even the auto driver had not seen those bags for nearly 4-5 hours. Fortunately, one customer asked him whether those two bags belong to him. He was puzzled because even He wasn’t sure who left those bags in there. There was a chit in Sameer’s bag, which is having some address and even Sameer’s photo [fortunately ;)]. The autowala wanted to return those bags but unfortunately, he was an illiterate and couldn’t read English. Then he took help from some friend of his, who could read and guide him to the address mentioned in the chit. When they both reached that address, it was Mr.X’s address and he immediately recognized Sameer and we got call from him. We met at some common place. We had even taken some sweets, along with some money to award that autowala. After give and take, say many thanks and all, we headed back to our lodge, relieved like Hell! MS Outlook email is cool! And like other mail services, you can link your other accounts like Facebook, Twitter, Flickr, etc.. with this Outlook account! One more thing, I can have my Outlook mail id aliased to @live.in, @hotmail.co.in..! Got this nice piece of writing and thought it would be nice to share here at this point of time where we are bombarded with price hike everywhere. Its just a Logic – and It May Work!! When asked to explain the price of eggs the store owner says, “The price has gone up and I have to raise my price accordingly”. This store buys 100 dozen eggs a day. He checked around for a better price and all the distributors have raised their prices. The distributors have begun to buy from the huge egg farms. The small egg farms have been driven out of business. The huge egg farms sell 100,000 dozen eggs a day to distributors. With no competition, they can set the price as they see fit. The distributors then have to raise their prices to the grocery stores. And on and on and on. Then week before Diwali the price of eggs shot up to Rs. 40 a dozen. Again he asked the grocery owner why and was told, “Cakes and baking for the holiday”. The huge egg farmers know there will be a lot of baking going on and more eggs will be used. Hence, the price of eggs goes up. Expect the same thing at Christmas and other times when family cooking, baking, etc. happen. This pattern continues until the price of eggs is Rs. 60 a dozen. The man says, ” There must be something we can do about the price of eggs”. He starts talking to all the people in his town and they decide to stop buying eggs. This didn’t work because everyone needed eggs. Finally, the man suggested only buying what you need. He ate 2 eggs a day. On the way home from work he would stop at the grocery and buy two eggs. Everyone in town started buying 2 or 3 eggs a day. The grocery store owner began complaining that he had too many eggs in his cooler. He told the distributor that he didn’t need any eggs. Maybe wouldn’t need any all week. The distributor had eggs piling up at his warehouse. He told the huge egg farms that he didn’t have any room for eggs would not need any for at least two weeks. The mind does not like discipline and will resist your efforts to discipline it. It loves its freedom more than anything else, and will try to stand in your way to master it, in any way it can. It will cause you to forget to do the exercises, tempt you to postpone performing them or make you feel too lazy. It will find many tricks to stop and disturb you, but you can and must be stronger. Find a place where you can be alone and undisturbed. You can sit crossed legged on the floor if you can, or on a chair. Sit with your spine erect. Take a few calm deep breaths and then relax your body. Direct the attention to your body, and relax each muscle and part of it. Sit down to practice for about 10 minutes, and after a few weeks of training, lengthen the time to 15 minutes. Start with the first exercise, practicing it daily, until you are able to do it without any distractions or forgetfulness, and without thinking about anything else, for at least three minutes. Every time you get distracted, start again, until the 10 or 15 minutes pass away. You have to be honest with yourself, and proceed to the next one, only after you are convinced that you have practiced it correctly and with full concentration. It does not matter if your concentration is weak now, it can be developed and strengthened like any other ability, through training and investing the necessary time, energy and earnestness. Take a book and count the words in any one paragraph. Count them again to be sure that you have counted them correctly. Start with one paragraph and when it becomes easier, count the words in a whole page. Perform the counting mentally and only with your eyes, without pointing you finger at each word. 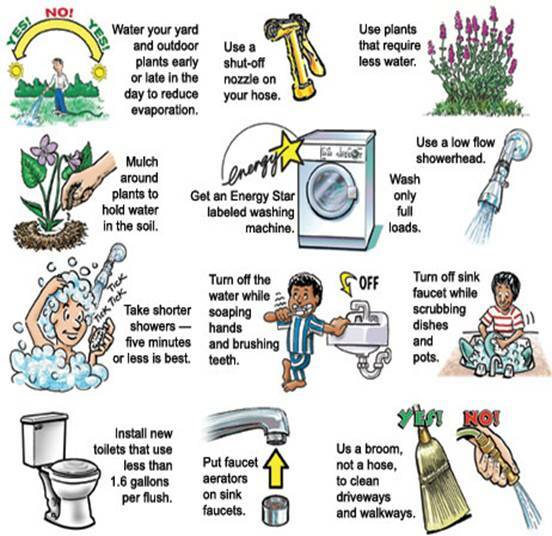 After getting to know that today is Water Day, I thought of sharing some tips on Saving Water. And I found a very good pictorial information to do this from http://energyprosandcons.org/make-the-switch-to-green-living site which I have shared here. On this Water Day, lets pledge to Save Water to Save Life! Money has no memory; Experience has! I have this write-up in my mail box from a long time. Even though its an old article, the thoughts are timeless. I just happened to read this again recently, and I felt so refreshed, as I had felt the first time I read it. Many thanks to the original author. Money has no memory; Experience has. You will never know what the total cost of your education was, but for a lifetime you will recall and relive the memories of the schools and colleges. Few years from now, you will forget the amount you paid to settle the hospitalisation bill, but will ever cherish having saved your mother’s life or the life you get to live with the just born. You won’t remember the cost of your honeymoon, but to the last breath remember the experiences of the bliss of togetherness. Money has no memory; Experience has. Good times and bad times, times of prosperity and times of poverty, times when the future looked so secure and times when you didn’t know from where tomorrow will come… Life has been in one way or the other a roller-coaster ride for everyone. Beyond all that abundance and beyond all that deprivation, what remains is the memory of experiences. Sometimes the wallet was full… sometimes even the pocket was empty. There was enough and you still had reasons to frown. There wasn’t enough and you sill had reasons to smile. The first time you balanced yourself on your cycle without support… the first cry… the first steps… the first word… the first kiss… all of your child. The first gift you brought for your parents and the first gift your daughter gave you. The first award.. the first public appreciation… the first stage performance. And the list is endless. So, what if it’s economic recession? Let it be, but let there not be a recession to the quality of your life. You can still take your parents, if not on a pilgrimage, at least to the local temple. You can still play with your children, if not on an international holiday, at least in the local park. It doesn’t cost money to lie down or to take a loved one onto your lap. Hey! Aspects like your Health, Knowledge development and Spiritual growth are not economy dependent. Time will pass… the economy will revive. Recession can make you lose out on money. Let it not make you lose out on experiences… If you are not happy with what you have, no matter how much more you have, you will still not be happy! Make a statement with the way you live your life: How I feel has nothing to do with how much I have!